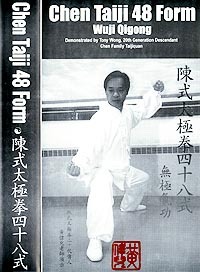 Grandmaster Feng Zhiqiang's Taijiquan system 48 Form reference tape is now available for purchase. The Chen 48 Form is demonstrated by Tony Wong in three speeds - demonstration speed, medium speed, and slow speed (slight variations in each speed to reveal various potential/possibilities in the form) and in two different views. This videotape also includes instructions on Wuji Qigong (Master Cai Song Fang's teaching) - alignment of accupressure points to achieve optimum body structure for maximum internal energy flow. This videotape is produced as a reference tape for Tony's students and as a vehicle to spread the Chen 48 form in the United States. *DVD version of this Video Tape is also available for the same price. Contact in Finland or Europe - send email to: Jari.Karjala@iki.fi for further information. Chen Family Taijiquan: Gong Fu Frame (Lao Jia) Zun Gu Taiji DVD - Limited Commemorative Edition demonstrated by Grandmaster Chen Qingzhou is now available for purchase. 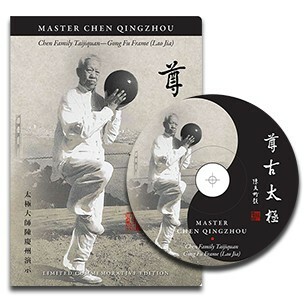 This DVD is a commemorative edition of Grandmaster Chen Qingzhou demonstrating the Chen Family Taijiquan Lao Jia First Form, Second Form, Taiji Sphere and Push Hand drills. It is a remastered transfer from video recordings of Grandmaster Chen Qingzhou's Zun Gu Taijiquan Lao Jia forms taken about 20 years ago to preserve the purest, most direct Taiji transmission from his teacher, the Venerable Chen Zhaopi, who insisted on maintaining the original Taijiquan system with its original movements and simplicity instead of modifying it. "Zun Gu" Taiji means "Revere the Ancient" Taiji and it represents the commitment of Grandmaster Chen Qingzhou to his teacher to preserve the Chen Family Taijiquan lineage, to share this Chinese cultural heritage, and to openly pass this original Lao Jia System to the world. In China, the Chen Family Taijiquan Lao Jia System was widely acknowledged as the ancestor of most currently recognized Taiji Systems including the Yang Style, the Wu/Hao Style, the Wu Style, and the Sun Style. Quantity discount for people who buy 10 or more DVDs. Please email or write to Tony Wong for price. For people living in the San Francisco Bay Area who want to save the $5.00 shipping and handling fee, local distribution points are available. Please email or write to Tony Wong for locations. or write to: Tony Wong at the address below.